I love how I work for a wine company and yet when we (me and the colleagues) venture out for Friday Lunch we all end up drinking beer! Maybe it’s the fact that we think, speak, and look at wine all day that drives that need for a fresh, crisp bubbly beer or in fact could it be the need for something you can gulp down and feel some what “thirst quenched” by? As the sun was shinning here in Newcastle, NSW we (well me and two others) decided the best place to go would be the Honeysuckle Hotel as you can sit in the sun – needless to say although the sun was out and the skies are blue, the wind was wild and we ended up sitting inside. Most places around our office offer a good lunch time special. Sometimes we opt for $20 pizza and a pint, if we are feeling flush we go to the very popular but pretty pricey James Squires. 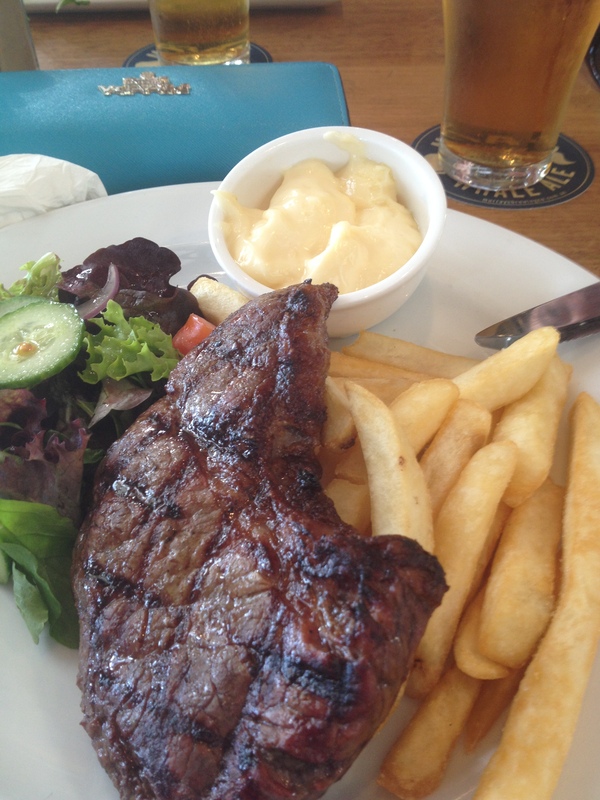 Today was a non flush day (even though it’s pay week) and we opted for the Honeysuckle Hotel where they offer $12 Steak and Chips, Schnitzel and Chips, Calamari and salad or battered fish and chips. They do of course have an array of other dishes available which are pretty $$$$ but for lunch $12 is great for a good feed, not mentioning the beers are nearly $7 for a scooner! 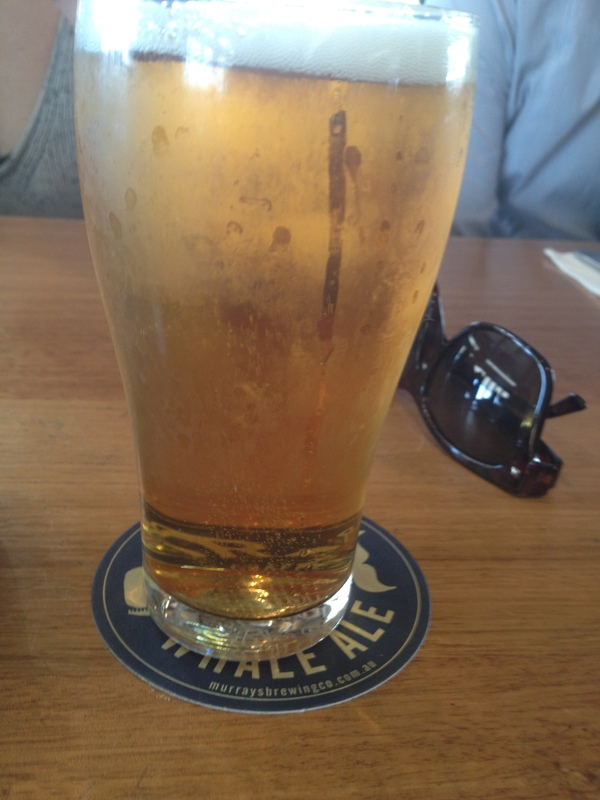 (for those of you not from Australia this is less then a pint!) So we opted for a cheap feed and saved our coin for two scooners! I ordered the Steak and Chips. I like my beef still “mooing” but because of being out with colleagues I didn’t want to gross them out with blood so ordered rare. Slight disappointment on the rareness of the steak as it was barely pink in the middle but still a gorgeous cut of meat and melted in my mouth. All the other options were a little disappointing. The calamari, although delicious, lacked the all important chips and the fish and chips were apparently frozen shop bought sticks of fish that did not satisfy the Red Dog (Christian) one bit. Aside from that, I, as always, enjoyed my colleagues/friends company and of course the witty remarks and copious laughter that echoed from our table. Cheers to a great working life! « Friday, Friday – What to do for dinner? Lol’s we could make it a regular “where’s Victoria’s sunglasses in this Friday lunch” picture!